If you are anything like me, you take home shopping very seriously. Sure, you look at the house size, number of rooms and other obvious things like textures and land impact. You’re also looking at the character of the home, little things that speak to you, draw you in and give you the desire to build your haven in this space. Perhaps it is an open floor plan or a grand staircase that catches your eye, whatever it is, there is always that “something” that will sell a house for each individual person. Today I had the pleasure of working with the White Plains Plantation House, fresh off the design line from DaD Designs. This home, available at the current round of Fameshed is truly gorgeous. I happen to live in Charleston so this particular style appeals to me greatly and I find it to be very true to the architecture found throughout much of my area of the South. “A graceful, spiral staircase welcomes you inside with library. The double living room on the right, and on the left the dining room with access to the kitchen. Casual family sitting areas further back. Upstairs 4 rooms large and spacious and all with access or on the terraces or balconies. The master bedroom has a second room which can be used as a study or a private bathroom. Same chance in two other rooms. Another thing to note about this house and something I think adds to the functionality of this home are the customization options. You will find “touch to access” menus located throughout the home that give you over 70 pre-loaded color options for customizing wall colors. 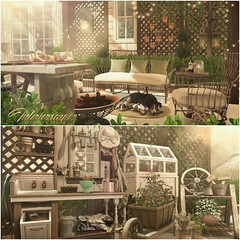 I have included some raw (windlight only) photos in this post a long with the editorial image because I wanted to really show you the charm of the house without the interference of pretty filters or interior decor drawing the eye away from the house itself. I highly recommend a walk-through of this home which you can do on location at the Demo area of Fameshed. Visit the DaD Designs Mainstore and check out their Facebook page to keep up with the latest releases and happenings.